We are delighted to offer a solution to the reoccurring problem of fines from a variety of materials. By nature this small fraction is difficult to clean up, particularly when it is wet and sticky, and proved to be a useless and expensive by product from many waste recycling processes. This cutting edge technology is based on a patented throwing motion which provides unrivalled material agitation. 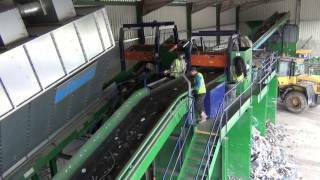 BlueMAC fines clean up systems have been developed for the separation of fine waste from 0 – 70mm size material. Historically, due to a number of factors concerning variations in densities, handling and flow characteristics, this material has proved difficult to separate and refine by waste processors. Currently, waste processors send their 0-40mm material which normally includes fine aggregates, sand, cement dust, plastics, polystyrene, paper and wood to a land fill site where they have to pay a premium rate for disposal. However the flip flow screen has been designed to maximise the recovery of these valuable reusable materials which can either be blended into their existing recycled aggregates or further screened and separated for sale as single sized materials. The beauty of our flip flow technology is that it cannot only be included in new waste recovery system designs but can easily be retrofitted to improve the efficiency of current plants.